Risk-based monitoring (RBM) is a hot topic in the clinical trials arena. It’s a new way of designing and operating clinical trials. Now, rather than visiting each clinical trial site and reviewing all patient records, you identify just those who present the higher risk of poor data quality, fraud and weak operational efficiency. Last month at the annual Drug Information Association conference, Richard Zink gave two presentations on the topic of RBM and turned up the heat on interest in the subject. 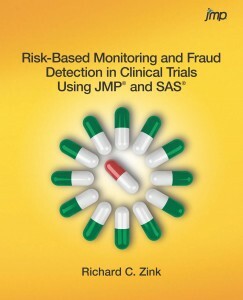 Richard, who is the lead developer on RBM for JMP and a prolific blogger on the topic, will release his book, Risk-Based Monitoring and Fraud Detection in Clinical Trials Using JMP and SAS, on July 16. Recently, we talked with Richard about his book and asked for his insight into what RBM means to clinical trials and the pharmaceutical industry. Why did you write the book, and how do you hope practitioners will use it? I thought a book would be a good idea to help current users get the most out of JMP Clinical. Initially, I was thinking about a book on safety topics. However, while I was mowing my lawn one random Saturday, I had an epiphany that many of the features that I was currently developing and had recently developed addressed issues related to data quality in clinical trials. Data quality is an important topic, since the well-being of patients’ needs to be protected, as well as the integrity of study conclusions. However, a significant proportion of trial costs in the pharmaceutical industry are associated with the review of trial data. The goal is to maintain high quality data with more efficient review, leveraging statistics and graphics as much as possible. I hope users from all backgrounds can use the text to gain insights into how they can identify and investigate issues related to data quality and misconduct in clinical trials. 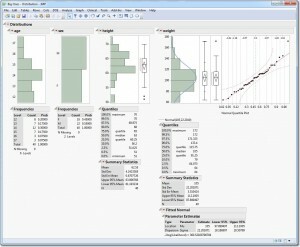 Further, the examples illustrate to new JMP users how easy it is to extend analyses beyond the reports that are immediately provided. I never used JMP while I was in pharma, which in retrospect is very unfortunate since it is so easy to explore data using JMP. I hope to convince others in clinical development of how great JMP is – mostly so they don’t make the same mistake I did. Tell me something surprising you discovered while researching the book. In pharmaceutical trials, source data verification (SDV) – which is the act of comparing the case report forms (CRFs) used to collect trial data against physician records – has traditionally been performed so that all CRF fields are verified. On the surface, reviewing every data point seems like a good way to capture errors and provide a high-quality database. However, this manual process doesn’t easily allow for comparisons across time, patients and other clinical centers, which are extremely effective methods for identifying unusual data. Furthermore, despite some misconceptions, 100 percent SDV is not a requirement of the FDA. Given the cost of traditional methods, their limitations in assessing various aspects of data quality and the lack of regulatory requirement, I am bit surprised at how these practices became so widespread. The good news is that the industry and numerous regulatory agencies are working to identify effective and efficient means of providing quality data, all while maintaining sufficient protections for the well-being of trial participants. What is one of the most important insights from this book? It’s really important to understand that every team member has a role to play in the review of trial data, and each individual brings a unique skill set important for understanding patient safety, protocol adherence, or data insufficiencies that can affect the final analysis, clinical study report, and subsequent regulatory review and approval. What do you think is the first step a pharma company/sponsor has to take to begin implementing RBM? First, companies will need to identify all of the data sources they are interested in using for RBM, and there are many possibilities. For example, the study database can provide information on safety outcomes, disposition and enrollment. Randomization systems provide data on enrollment, screen failures and drug dispensation. Database management systems contain data on queries to resolve data inconsistencies, missing CRF pages, and how responsive investigators are to addressing issues. Statisticians and programmers may write programs to identify protocol deviations and eligibility violations. Monitors may manually collect data on protocol violations, and other issues at the site that wouldn’t otherwise be available electronically. Once these sources are identified, they need to be integrated. The process to refresh this integrated data set needs to be straightforward so that it can be used on a frequent basis. What value will companies see with RBM, and what pitfalls will they encounter? There will be cost savings to companies. I also believe there will be improvements to data quality by focusing efforts on the data most important to the trial, utilizing statistics and graphics to identify important signals efficiently. I think there will be challenges in integrating data as I described above, but I think the biggest issue will be one of ownership of the RBM process. Who is responsible? Data management? Statistics? Clinical operations? IT? All of them have important roles to play throughout the process, but I don’t think it will be the responsibility of any one department. Clearly defining the needs and responsibilities of each team member will be important for RBM to run like clockwork. There will need to be investment in sufficient training to educate people on new processes, and to get them comfortable with new tools for performing their jobs. How does RBM and this book ultimately help patients in our healthcare system? Current monitoring practices are estimated to consume up to a third of the cost of a clinical trial budget. The potential savings could be used to make medications more affordable, allow for greater innovation in established treatment areas or pursue development in areas of unmet need. Further, I think the proactive risk-based approach to quality in clinical trials will more effectively protect the individuals participating in clinical trials.